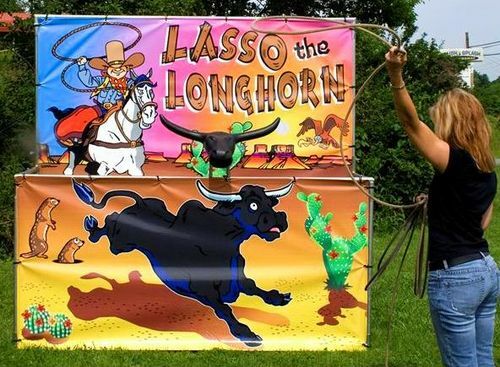 The Lasso the Longhorn frame game is perfect for any western theme party hire. Perfect add on to any of our Bucking bulls hire. Kids and adults will have a rip-roarin' time trying to lasso the bull's head! Each Lasso the Longhorn comes with an authentic western lasso as well as rope rings for the younger children. This game is addictive as your guests will not want to walk away until they have mastered it. The aim of this game is to throw the lasso at the longhorn attached to the game stand. It’s a lot harder than it sounds and looks!